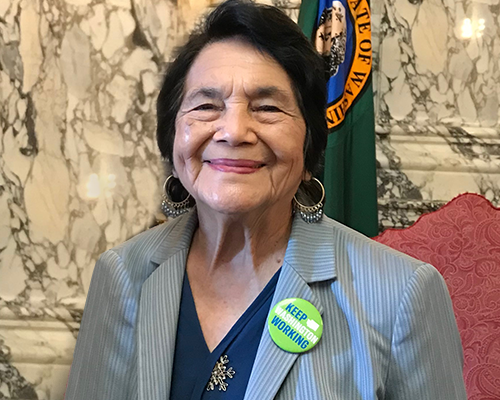 April 10 is Dolores Huerta Day in the state of Washington, thanks to legislation passed this month to commemorate the birth of the 88-year-old civil rights and labor leader and recognize her contributions. Ms. Huerta worked alongside Cesar Chavez to fight abuse and discrimination against farm workers and women. She coined the phrase, “Si, se puede,” and together with Chavez in 1962 launched the National Farm Workers Association, which preceded the United Farm Workers of America Union. A teacher, Ms. Huerta saw how children of farm workers were harmed by poverty. Spurred by the injustices she observed, she sought to bring change to her community, organizing for improved pay and living and working conditions for farm workers, including disability insurance. “Dolores Huerta worked diligently to not only be a voice for underrepresented farm workers, but also a voice for women to gain the courage to step into roles of leadership,” said Rep. Lillian Ortiz-Self, D-Mukilteo, prime sponsor of House Bill 1906, which received support and testimony from the Washington State Labor Council, Central Washington University and the ACLU-WA.